By which I mean that I’m hosting, but Meetup sent me a reminder. We’re going to be talking Gutenberg, and if there’s interest I might quickly demo the recently announced support of plugins and themes on the WordPress.com Business plan. RSVP for the event on Meetup.com, and note we have a new location. The WordPress Louisville meetup comes to a new location on August 8th.## TopicGutenberg, the new post editor, is currently available as a beta plugin. Its block-based approach is quite a departure from the current editor experience. We’ll take a look at Gutenberg, go over how to try it out yourself, and how you can get involved with the project…. Sad news this morning. Branden Klayko, known in Louisville for his blog Broken Sidewalk, died recently. I never personally met him, but followed his work because his view of what Louisville could be matched what my ideal city should be. Coverage from the Courier-Journal, Insider Louisville, and WFPL all glowingly praise his efforts. We’ve done it. There’s a couch on our porch. We’re truly Kentuckian now. Only one thing remains: set it on fire. Right? Ber last ran the Kentucky Derby Festival miniMarathon in 2015, right after we found out she was pregnant with Grace. Ever since she finished, she’s been excited to run it again. Today she finished the 2017 miniMarathon, after fourteen weeks of training. I’m incredibly proud of her, and watching her complete such a big event really makes the last few months’ work and focus worthwhile. Recently I’ve been thinking about life more and more in terms of segments. The first segment of this year was Ber’s half-marathon. Our family’s #1 priority since the new year was Ber’s training for this event, and we were all on board with that. It’s not the only thing we did, but it was the most important thing. At work I tend to think in segments book-ended by meetups. My team just went to Washington DC and I’m now looking at the work I’ll be doing between now and the Grand Meetup in September. What seems appealing about this outlook is that it’s okay for big goals, because a segment is necessarily a large chunk of time. 14 weeks is a lot of time to get better at running. 5 months is a lot of time to get good work done. So even if every step forward is a small one, over the course of a segment you are certainly closer to your goal. It’s a (mini) marathon, not a sprint. My favorite seat at Monnik Beer Company is right there. Spray-painted message in the YMCA parking garage. A quick Google search says losing a pound requires about a 3500 calorie deficit. 14 calories every day is 5110 calories a year, so that’s 1.46 pounds a year. Skip the elevator; I always do. 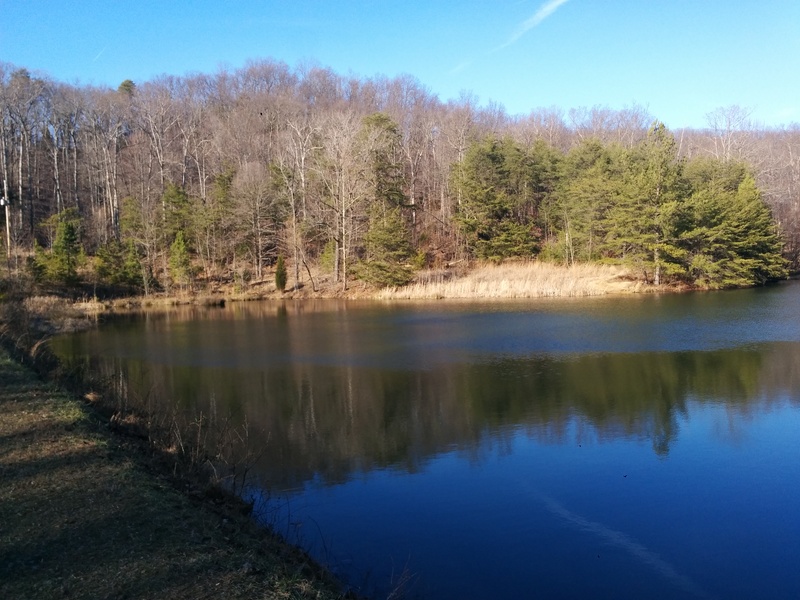 Louisville’s Jefferson Memorial Forest has three separate recreation areas and more than a dozen trails. One of their recommended hikes starts with the Yost Ridge Trail at the forest Welcome Center, until you get to the Mitchell Hill Lake Trail. The lake trail loops around Mitchell Hill Lake, whereupon you can backtrack the Yost trail to the welcome center again. 3.2 miles round trip. 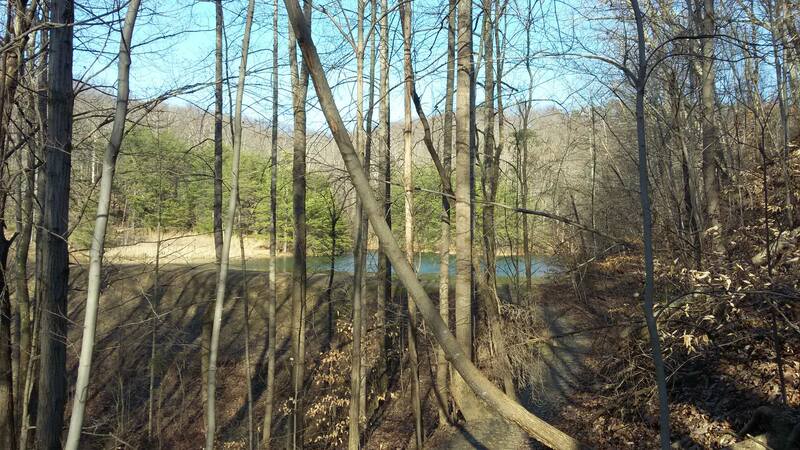 Amber, Grace, and I had been meaning to go on a hike for some time and today had perfect weather for it. We really enjoyed the trail, especially how the lake sort of pops into view all of sudden. Mitchell Hill Lake comes into view from the trail. Photo by Amber Gustafson. The edge of Mitchell Hill Lake. Panorama at Mitchell Hill Lake. Photo by Amber Gustafson. Looking for photos of the baby in the hiking backpack? Check out the baby photoblog.